Among the many postcard collections at the VGW Library and Archives are a set by the artist F. Earl Christy (1882-1961). He was an illustrator for many magazines and noted for his images of college women or beautiful young women sometimes playing sports. The set of postcards in our collection includes four cards of college women from Harvard (shown here), Yale, Princeton, and Cornell. In each, the young women are waving banners with their college colors and symbols. Each woman is wearing a dress to match the college colors - for example, crimson for Harvard and blue for Yale. The dresses on the postcards are made of silk. The images are embossed onto the postcards. The postcards were signed before the printing process so each card holds Christy's name. 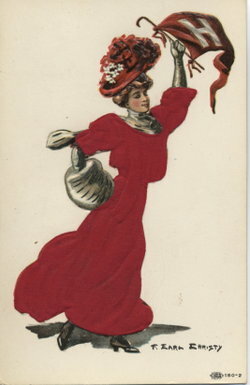 These postcards were produced around 1905 and were published by the Illustrated Postal Card Company of New York. At this time, F. Earl Christy was only 23 and attending Pennsylvania Academy of Arts. These were some of his early works. As with many travel postcards from this "Golden era," these cards served as souvenirs of their schools. They were probably collected by college graduates of the time period and are still very collectible today.